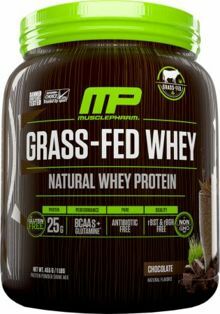 Mix one serving (1 scoop) of MusclePharm® Grass-Fed Whey with 8-12 fl. oz. of cold water. Vary the amount of water to achieve desired consistency and taste. Use in combination with whole food protein sources, a balanced diet, and exercise program. NOTICE: Use this product as a food supplement only. Do not use for weight reduction. Do not use as a sole source of nutrition. No significant difference has been shown between milk derived from rBST-treated and non-rBST treated cow. Do not use this product if you are pregnant, expect to become pregnant or are nursing. KEEP OUT OF REACH OF CHILDREN. STORAGE CONDITIONS: Store at room temperature. Exposure to heat, light or air can affect flavor or aroma. Therefore keep out of direct light or heat. Keep sealed when not in use. Cold-Processed Cross-Flow Micro-Filtered Grass-Fed Whey Protein Isolate, Natural Flavor, Cellulose Gum, Guar Gum, Xanthan Gum, Stevia (Leaf) Extract, Sunflower Lecithin. SUGGESTED USE: Mix one serving (1 scoop) of MusclePharm® Grass-Fed Whey with 8-12 fl. oz. of cold water. Vary the amount of water to achieve desired consistency and taste. Use in combination with whole food protein sources, a balanced diet, and exercise program.